The software that I use for making this blog has a calendar. I just noticed that this calendar doesn’t stop at February 29th. So, I wondered what would happen if I published something on the February 30th. I always dreamed of finding extra time. Stories about people who found methods to slow down clocks, travel back and forth in time, or otherwise cheat on Time always attracted me. And of course, I collect records that deal with Time and human efforts to get around It. 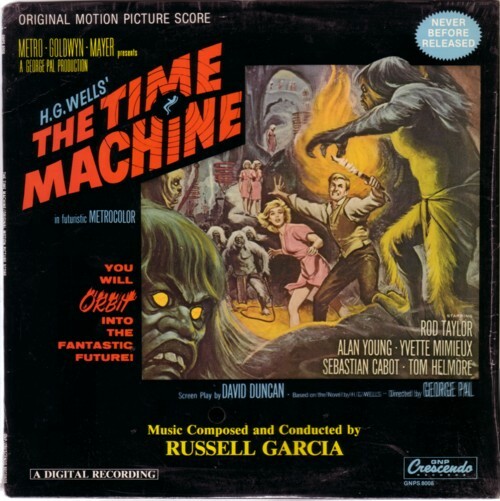 The soundtrack LP of the movie Time machine , released on the label GNP Crescendo, is one of the highlights in this section of my collection. The music is made by Russ Garcia, and he did a great job. I rarely see this soundtrack mentioned in blogs, but i think it is among the best in this genre. I particularly like the cover of the LP. If all my record covers were as good as this one!